Pomegranate seeds fit perfectly into the hollows of a crisp, hot waffle. 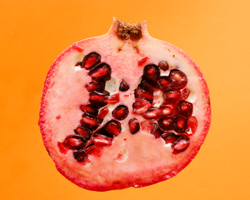 In this special recipe, the tart flavor of the pomegranates is paired with sharp, bitter orange. If you can find pomegranate molasses (wonderful product, which is like a deep red syrup–available in specialty shops and Middle Eastern food markets), drizzle this over the top in place of the usual maple syrup. Canola oil can be substituted for some or all of the butter. Combine the dry ingredients in a medium-sized bowl. Stir in the orange zest. Measure the buttermilk and then the orange juice into a 4-cup liquid measure. Add the eggs and beat gently with a fork or a small whisk until smooth. Pour this mixture, along with the melted butter, into the dry ingredients. Stir until thoroughly blended, scraping from the bottom and sides of the bowl, but don't overmix. A few lumps are okay. Lightly spray the hot waffle iron on both the top and bottom surfaces with nonstick spray. If you like, you can also rub on a little butter. (This is most easily accomplished by generously buttering a chunk of bread, and using the bread as a nifty, edible utensil to butter the waffle iron.) Add enough batter to just cover the cooking surface -- approximately 1/2 cup per standard waffle (1 cup per Belgian waffle). Cook for about 2 to 3 minutes, depending on your waffle iron. Don't overbake–you want it crisp and brown, but not too dark. It is perfectly okay to peek. Serve hot, with a drizzle of pomegranate molasses and pomegranate seeds sprinkled on top.